Shopping for a new Hyundai Veloster? Hyundai limits some safety features in the 2019 Veloster. Blind-spot monitors can’t be had on base or R-Spec models; adaptive cruise control only comes with the Turbo Ultimate. Given that, the Veloster Turbo has most of the gear sport-coupe buyers want and need–at least until the N model drifts into view. The 2019 Hyundai Veloster Turbo spends all its second-generation capital on feel-good features–and it works. The 2019 Hyundai Veloster gives asymmetry a second chance. 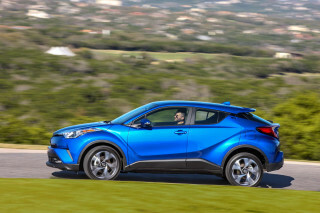 It’d have been easy to drop the sporty Veloster hatchback from the lineup, as crossovers take over the Hyundai brand. 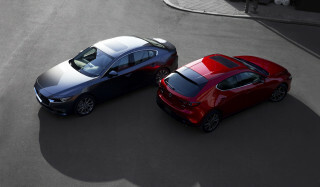 But the Veloster brings in buyers who might find a Civic Coupe alluring, or a VW Golf enticing. It’d have been even easier to add a fourth door to the 2019 Veloster. Hyundai hasn’t: the two-left-door, one-right-door layout still antes up something completely unlike anything else on the road. Something no Civic or Golf can offer. It’ll be fascinating to watch as the new, more compelling, better-sorted Veloster tackles the top Civic Type R and VW Golf GTI when it spins off a high-performance 275-horsepower Veloster N later this year. Sold in 2.0, 2.0 Premium, turbocharged R-Spec, Turbo, and Turbo Ultimate trim, the 2019 Veloster smooths out some of the wrinkles of the first-generation model. Hyundai’s deep bag of styling tricks makes sense of its offbeat door setup, though we’re not 100 percent sure about the abrupt end of the side scoops. The interior’s similar to that in the Kona SUV and it’s agreeably finished in plastic trim and capped by a big touchscreen. Performance ranges from naturally aspirated to fully stoked. We’ve only driven the Veloster Turbo in R-Spec and Ultimate trim, but the 201-horsepower turbo-4 pairs well with the Veloster’s stripped-down curb weight of less than 3,000 pounds. The manual Turbo has a sweetly snicky shift lever, while dual-clutch cars have clean midrange shifts, with an occasional bumble in low-speed changes. Handling’s improved this year thanks to a stiffer body structure, and a choice between 18-inch all-season or summer tires. Quick steering isn’t quite as precise as the new multi-link suspension’s ride motions, but it’s fine. The Veloster N’s limited-slip diff and P-Zero tires will be welcome adds. Interior space isn’t really changed, but the Veloster’s front seats have better padding. The funky door layout is more a stunt than a utility plus, but the Veloster has good cargo space once its rear seats are folded down, and occasional space in back for two adults. Safety data isn’t in yet, but the 2019 Veloster gets standard automatic emergency braking. Blind-spot monitors and adaptive cruise control can be fitted. All Velosters get standard power features, Bluetooth, and Apple CarPlay and Android Auto; Turbo Ultimate models have beige leather with natty striping, navigation, wireless smartphone charging, and a head-up display–but no power seats. The 2019 Hyundai Veloster refines its offbeat look with an expert styling hand. 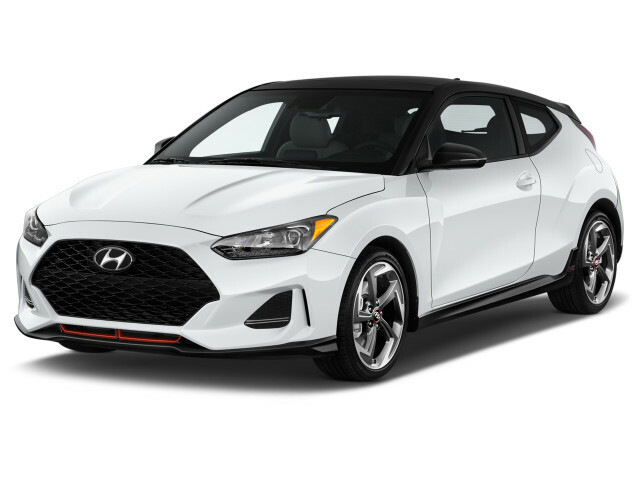 The 2019 Hyundai Veloster retains its same unique shape, with a sporty roofline and a spare door on the passenger side. But it’s reached deep into its bag of styling riffs to clean up a shape that’s more harmonious than before, more neatly formatted. With the 2019 Veloster, Hyundai has better blended a deep front fascia, a prominent grille, and slimmer headlights with the rest of the Hyundai lineup. Designers pushed the A-pillars rearward to stretch the hood out, tapered the roofline, and flagrantly flared the wheel arches. An abrupt end to the front side sculpting and a rear-fender flare would be worthy of a TED Talk on any other car, but the Veloster’s funked-up door collection pushes all that to the background. In back, a new diffuser flanks the center-exit exhausts, with a single opening in the standard Veloster and a pair of pipes in the Veloster Turbo. 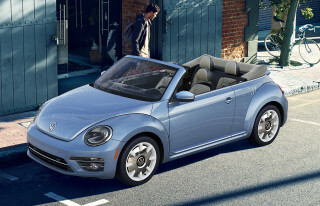 A contrasting roof is available for the Turbo model as well. Much of the Veloster's interior design is inspired by the Hyundai Kona. A large display—a 7.0-inch is standard, but an 8.0-inch display is optional—crowns the center stack. The cabin has healthy amounts of piano black trim and hard plastic, but it’s executed very nicely. Each of the Veloster's five trims gets its own unique interior theme, with simple black cloth on the base 2.0-liter model and a black cloth/leather combo with red piping on the 2.0 Premium. Move up to the Turbo R-Spec—the entry level trim for the mid-level engine—and there's a neat black cloth with yellow accents. The mid-grade turbo wears black leather and cloth with red accents, while the Turbo Ultimate features the same black and red dash design with beige leather upholstery. Veloster Ns get their own styling bits with red accents and a quartet of paint color options. The 2019 Hyundai Veloster turbos dial up the boost, and the driving fun. While Hyundai holds off on the hottest Veloster N for a launch later this year, it’s doled out some Veloster Turbos for initial press drives. Hyundai largely carried over the Veloster's two standard powertrains with its redesign. The base 2.0-liter inline-4 has slightly more power than it did before: 147 horsepower and 132 pound-feet of torque, versus 132 hp and 120 lb-ft in the 2017 model (Hyundai skipped the 2018 model year). The engine first appeared in the 2017 Elantra. We’ll add more to this review once we’ve sampled the base powertrain, which pairs that engine with either a 6-speed manual or a 6-speed automatic. The Veloster Turbo's 1.6-liter, meanwhile, is a pure carryover, boasting the same 201 hp and 195 lb-ft of torque as every other vehicle with this engine. With peak torque at 1,500 rpm, it’s energetic and response, and feels strong enough to turn in 6-second 0-60 mph times, thanks to curb weights for the range that start at 2,701 pounds and rise to only 2,987 lb on Turbo Ultimates. Turbos also get amplified, synthetic noise pumped into the cabin. The studio-created sound isn’t obnoxious, and can be toggled down from pop-and-crackle levels to off, at which point the turbo-4 sounds pretty mellow and sweet, anyway. The 2019 Veloster also adopts a set of drive modes that toggle from Normal, to Sport, and Smart on automatic versions, and Normal and Sport on manual models. The modes alter steering heft, throttle progression, and shift timing. The Veloster Turbo R-Spec comes with a 6-speed manual–and later this year will come with a B&M Racing sport shifter. It’s a snicky piece with cool metal touch and precise throw, and a nice choice versus the optional 7-speed dual-clutch transmission, which works fine at moderate speeds and higher, but bumbles an occasional shift at city speeds, like every other DCT on the planet. Topping the range is the new Veloster N with its 275-hp, 260 lb-ft 2.0-liter turbo-4 paired to a 6-speed manual transmission. We’ll add more here once we’ve driven it, too. Fuel economy for the lineup ranges from 25 mpg city, 33 highway, 28 combined on manual-shift base cars, to 28/34/30 mpg on dual-clutch turbos. Hyundai doesn’t just ditch the lower-economy base engine because the Turbo’s supply-constrained, and is more expensive to boot. With its stiffer body and new rear suspension, the 2019 Hyundai Veloster has more predictable and capable handling. We needled a pair of Turbos around suburban Austin, and found the new Veloster doesn’t get flustered much. The suspension now pairs front struts with a multi-link rear suspension, which replaces the rear torsion axle. Mid-corner bumps and imperfections easily upset the last-generation Veloster, but no more. It doesn’t have huge amounts of ride compliance, but the 2019 Veloster Turbo on all-season tires feels soft enough to be comfortable every day. It skitters through tight corners as it overpowers those less aggressive all-season treads, but on the summer tires sold as an upgrade, the grip lives up to the precision dialed into the new rear end. 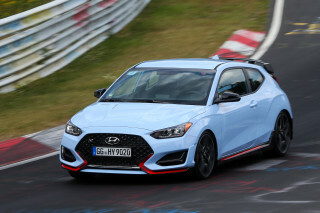 If its steering were just a bit more involving and accurate–there’s some on-center wander–the Veloster would earn some instant comparisons to the Civic Si. As it stands, it’s close. The N version may turn that talk into comparisons with Honda’s striking Civic Type R. The Veloster N will have a firmer suspension, a limited-slip front differential, and special steering tuning. It will come standard with 13.0-inch front and 11.8-inch rear brakes, while upsized 13.6- and 12.4-inch units will be optional. Standard tire fitment for the Veloster N will be 18-inch Michelin Pilot SuperSport rubber, while 19-inch Pirelli P-Zero tires will be an option. Stay tuned. The 2019 Hyundai Veloster sticks with its asymmetrical doors, and amps up interior quality. With a 104.3-inch wheelbase, and a 166.9-inches overall length, the 2019 Hyundai Veloster is only fractionally larger than the first-generation model. Interior space is almost unchanged, but interior quality has vaulted to new heights. The Veloster’s hatchback styling puts two doors on the passenger side, one longer door on the driver side, and a hatch for cargo. That gives it some interesting utility, though we wonder if the distinctive layout would be missed by any buyers. In front, the Veloster’s seats come covered in cloth on base models, a grippy cloth and leather combination on some Turbos, and full leather on the top Turbo Ultimate. We sat in the more expensive seats, and found them much improved over the last Veloster, with much thicker upper back bolsters and a good range of manual adjustment. The cabin’s somewhat narrow, still, but the Veloster doles out just enough head room on sunroof-equipped models to keep tall drivers and front passengers from touching head to headliner. Power seats are no longer on the options list. The dash borrows many styling elements from the Hyundai Kona SUV, including central display screens and climate controls. A 7.0-inch touchscreen infotainment system comes standard while an 8.0-inch is optional. Both displays sit atop an attractive center stack that features a handsome, logical arrangement for HVAC and redundant audio controls. At the bottom, an iPhone X-sized cubby sits alongside standard USB and auxiliary inputs. A wireless charging pad is available, too. Unlike the Kona, the Veloster sets off the passenger with grey center console trim, while the driver’s framed in black. It’s a visual distraction from the petite size, and it works. Medium-sized passengers are the largest passengers that fit easily in the Veloster’s back seat, and those in the rear left seat will have to choose whether to enter via the rear right-side door and clamber over the seat, or to swing the wide driver-side door and jump in that way. It’s not much easier to get in the Veloster for that fourth passenger, than if it were a two-door hatchback. A 6-foot passenger will have to slouch a bit and splay their knees to fit, even if the passenger and driver slide their seats well forward. Fold the rear seat down and the Veloster becomes the two-seat cubby hole it longs to be. There’s 19.9 cubic feet behind the rear seat, about that much extra when the rear seat’s folded down. Liftover is high, but Hyundai tucks the hatch release cleverly into the rear wiper housing. Interior space hasn’t changed much, but the Veloster’s interior sounds much more impressive than before. 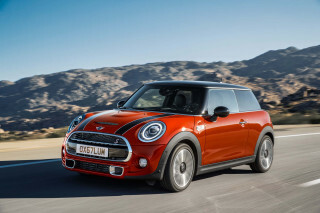 The stiffer body means less suspension noise; the active-noise control for the turbo-4 can be shut off completely. Door panels are thicker, there’s more sound deadening, and though the Veloster cabin wears lots of hard plastic, it’s toned and grained to fool an otherwise sharp eye. The 2019 Hyundai Veloster hasn’t been crash-tested yet. Since the 2019 Veloster is new, neither crash-test agency has been able to put it through the paces. Every 2019 Veloster gets forward collision warning with automatic emergency braking as standard, along with a rearview camera and active lane control. Higher-spec models can be fitted with blind-spot monitors, automatic high beams, and a driver-attention display that detects when it might be time for a coffee break. Adaptive cruise control and pedestrian detection are available, but only on the most expensive Turbo Ultimate; the R-Spec gets blind-spot mirrors instead of electronic monitors. We’ll update this section when more data is published. The 2019 Hyundai Veloster bundles fun in with plenty of features. The 2019 Veloster is available in five trims, with two designated for the 2.0-liter—named 2.0 and 2.0 Premium—and three variants for the Turbo, starting with an R-Spec, an eponymous trim, and the Turbo Ultimate. Every 2019 Veloster gets power features, cruise control, a rearview camera, Bluetooth, a 7.0-inch touchscreen display, Apple CarPlay and Android Auto, and forward-collision warnings with automatic emergency braking. The base price of $19,385 includes an $885 destination charge and the manual transmission; a 6-speed automatic runs an extra $1,000. To that, the $23,635 Veloster Premium adds 18-inch wheels, blind-spot monitors, keyless ignition, wireless charging, an 8.0-inch touchscreen for infotainment, Infinity speakers, a moonroof, heated front seats, and cloth/synthetic leather upholstery. The $23,785 Veloster R-Spec swaps in the 1.6-liter turbo-4 and a manual transmission. It starts with the base model’s gear, and adds Michelin Pilot Sport 4 summer tires on 18-inch wheels, LED headlights and taillights, keyless ignition, Infinity speakers, and alloy pedals. The $26,285 Veloster Turbo takes that setup and adds the dual-clutch transmission, heated seats, a sunroof, blind-spot monitors, and automatic climate control. At the top of the lineup, the $27,535 Veloster Turbo Ultimate offers either transmission and standard leather upholstery, a black roof, navigation, wireless charging, and pedestrian detection for its automatic emergency braking. It also sports a head-up display that shows a tach and navigation commands. Turbo or no, the 2019 Hyundai Veloster tips the gas-mileage scales in the right direction. The 2019 Hyundai Veloster skips major drivetrain changes, and in the process scores good fuel economy ratings. The Veloster draws power entirely from 4-cylinders, with or without turbos. 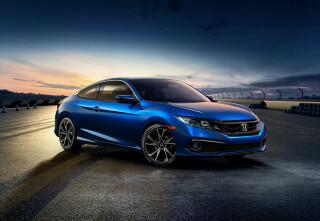 The naturally aspirated version earns EPA gas mileage ratings of 25 mpg city, 33 highway, and 28 combined when it’s fitted with a 6-speed manual gearbox. With a 6-speed automatic, the ratings rise to 27/34/30 mpg. The 2019 Veloster Turbo checks in at 26/33/29 mpg with the manual shifter, and 28/34/30 mpg when equipped with the dual-clutch transmission. Why no red R-Spec Velosters? The R-Spec is supposed to be the sportiest Veloster. Red is the color usually associated with sport cars. It is strange that the R-Spec is the only Veloster not offered in RED. Looking for a different year of the Hyundai Veloster?